As a Product Scientist at 23andMe, Ruth develops engaging scientific content for 23andMe’s genetic reports. Ruth received her bachelor’s degree in molecular biology from Princeton and her Ph.D. in cancer biology from Stanford, where she shared her love of science by teaching hands-on classes to students at local schools, hospitals, and museums and by blogging on the San Jose Tech Museum’s website. After grad school, Ruth worked as a AAAS Science & Technology Policy Fellow at the State Department, helping promote science education and entrepreneurship in sub-Saharan Africa. 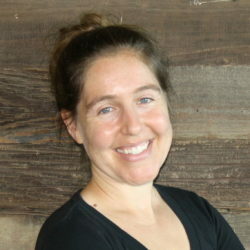 Before coming to 23andMe, Ruth served as a teaching fellow in the Thinking Matters program at Stanford, teaching courses on experimental design, bioethics, and cancer.